I can’t believe it! I am so excited! 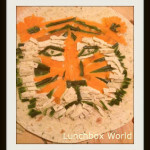 I’ve been chosen to take part in the Lunch Less Ordinary Challenge! A small select group of bloggers! Maybe it has something to do with the fact I often am found dishing up tasty morsels of lunch!? 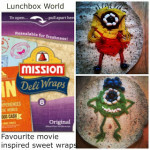 Make lunch for your neighbour – either at work or at home! Well, I immediately ruled out challenges 1 and 2: the kids are all at school, so unfortunately no longer little people I can do an indoor picnic with. I could have used teddies and dolls instead, but well, it wouldn’t be right, would it? As for challenge 2, our neighbours are all retired, so they can be found either playing golf, tennis, or playing bridge on rainy days! I think you get the picture, they are an active bunch in our road and rarely at home! So the challenge of tomatoes in every lunch immediately jumped out at me! Without a second thought, I sped off in the car to do a quick trolley dash, stocking up on fresh tomatoes: beef tomatoes, cherry tomatoes, plum tomatoes, red peppers, orange peppers, puff pastry, risotto rice, salads, Mission Deli Wraps (of course!) and more. Juicy tomato recipes were popping into my head left right and centre, and quickly I realised that there are many ways with a tomato. Being a busy week, ending in me away all weekend, hubbie has to manage the weekend shift. So to be sure we keep to the challenge, some of the tomato recipe ideas have been quick and easy ones, just to be sure that hubbie will keep us on track! But these could easily be switched out for home-made, made from scratch recipes. I will keep the kids-in-charge challenge for another week, as that could be a lot of FUN (and give me a well earned break)! So here’s our week’s worth of lunch time meals with the tomato. And before I forget, if you want any of the recipes, just comment below and I can post them up next time. 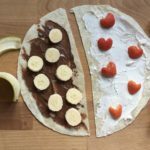 If these are being made in a packed lunch, our tip is to pre-slice the tomato, ready for eating, but take the tomato in a separate container. Just add at the last minute to avoid those soggy bottoms! Tuesday : Pizza topped with tomato, mozarella, basil and pepperami, with salad on the side. This is perfect – the kids love pizza and it uses up the leftovers perfectly. Wednesday : Crispy bacon slices, with sliced tomato on wholemeal with a smattering of mayo. Thursday : Tomato risotto – made by Spike, thanks to the cookery classes he’s having at School. It tasted so great, we ate it before we had a chance to snap it! (Note to self: photo EVERYTHING even though hubbie hates the speed with which I whip out my camera/phone these days). Saturday : Tomato soup with basil, with chunks of this delicious cheese and sundried tomato stromboli I found on the side. My plan had been to make the Jamie Oliver recipe in his 30 minutes cookery book, but as I say, with me away, it ended up being these new squeeze and stir sachets… So if you’re ever pushed for time, these are well worth a try, if you’re after something heart warming in a jiffy! Sunday : Tomato, Mozzarella and Ham Open Tart, topped with basil with tomato salad on the side, new potatoes and lambs lettuce salad – this is really quick and easy, taking just 20 minutes in the oven to bake! My plate! It was all delicious! I had planned to make stuffed tomatoes with savoury rice … and home-made pizza with the kids, oh and sun-dried tomato and bacon in a creamy sauce with pasta, but where has the week gone?! So we’ve still got the amazing beef tomatoes waiting patiently in the fridge, hoping to be turned into delicious stuffed tomatoes come tomorrow, thanks to a recipe I found by Delia. So watch this space for these, and the sun-dried tomatoes still in their jar. Massive Beef Tomatoes all huddling in the fridge, waiting to be turned into something special! If tomatoes could speak, I just wonder what they’d say, all huddled together in the fridge. So, over to you, which challenge would you choose? And if it is tomatoes, like us, what would you do with them? Note: We have been chosen by Mission Foods to take part in this challenge which is also a competition with prizes. 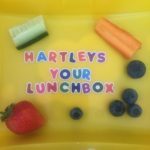 New Lunchbox Competition starts today! 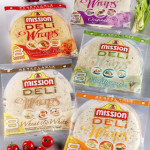 10 prizes of Mission Deli Wrap goodies up for grabs! « Be Honest Now – Are you a Luncheonist?